Thank you for showing an interest in my passion for India and please may I share with you a little about myself. I was born in Bareilly, a city in the north of India where my father was an officer in the Indian Army. I spent the first 16 years of my life in India where I grew up speaking Hindi / Urdu. Although the majority of my adult life has been spent in my ancestral home of the United Kingdom, my affection for the land of my birth has not diminished and now I return annually having formed a deep connection to both countries - both of which I think of as home. I feel particularly honoured to have been presented with The Pride of India Gold Award in recognition of my promotion of India and my writing on the country and its people. I hope through my website I can share my passion with you and encourage you to visit this wonderful country to see and meet it's people yourself. India: The Peacock’s Call is a memoir in the manner of a travelogue, blending an account of my travels in India with reminiscences of my childhood. Part I begins with a trip in 1997 and is brought up to the minute with Part 2 ending in September 2008, where the differences of a decade are brought to light and the substantial changes of India’s place in the world are discussed. India: The Tiger’s Roar is a personal account of my pilgrimage to India’s great wildlife parks, tying in the plight of the tiger with a journey round Central India. Finally, India: The Elephant’s Blessing follows my 2,500 km journey through Southern India.This was written after a personal request from the Director of Tourism for the Indian government, shortly after the Asian Tsunami. My fourth book was commissioned by the publisher of the series Quicklook Books and is Quicklook at India which was specifically written for business people who seek to do business in India. It is a précis of India from 2,500 BCE to the present day and gives the reader a concise idea of India and her place in history and the modern world in 25,000 words. 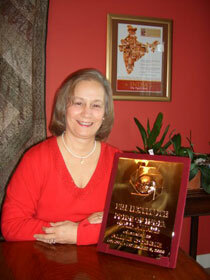 I received The Pride of India Gold Award on 9th November 2006 from The NRI Institute at a glittering banquet and ceremony in The Portman Hotel, London. Recipients of these awards are considered to have achieved something significant for India, the Indian Diaspora or Humanity in general. I feel privileged and honoured to have been considered eligible for the award. I hope I have helped to create a greater understanding and appreciation of India. My books have been reviewed and featured in a multitude of publications including The Royal Society for Asian Affairs, The Hindu, The Pioneer, Explore! Magazine, The Scottish Field, and on the BBC 4’s travel site Excess Baggage. Aline’s ability to view India as an insider while simultaneously being able to see it through the eyes of a visitor gives her books a keen sense of realism and a perspective not found in most India travel memoirs. All at once the reader is engulfed by Aline’s warmth and love of India, but her criticisms keep the books honest and give an authentic account of her experiences.